Initial Impression of NxStage at home . . .
On the machine . . . and running. I have been home, with my NxStage machine, since March 25th. So far I really like it. It has definitely improved my quality of life . . . with the possibility of even further improvement in the future when Canada passes more NxStage features. (I’ll write more about that later). 1. 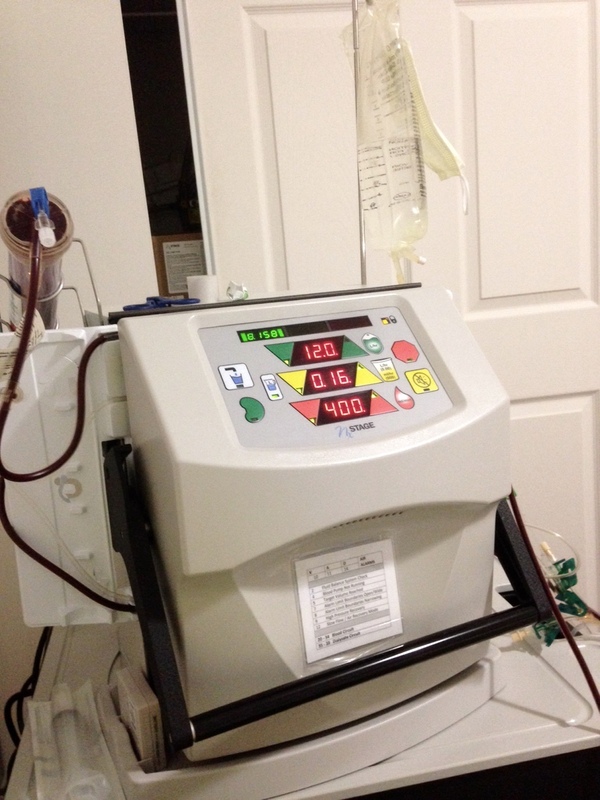 I’ve had a little nausea and stomach pain as my body adjusts to the machine – as it’s a different dialysis system. These symptoms are diminishing over time. It is manageable. 1. It is a lot easier for me to set up. I no longer feel dread about getting on the machine because of set up. 2. Less things can go wrong with set-up and while I’m on the machine – as it’s a more simple system. That gives me peace of mind. 3. I have way less supplies in my 2 bedroom apartment. I am able to store everything in my closet. 4. There is a 24 hour NxStage “help line” for technical support that I can call when I’m having issues. I have used it a few times and it’s been wonderful to have this help. This is a huge stress reliever for me . . . knowing that I always have someone to speak to. Bonus . . . if I would like to move to a new apartment I can do so without incurring the costs of installing hospital grade electric and special plumbing. The NxStage machine does not need it. Future Bonuses . . . eventually I will be able to travel with this machine!! And in the future, with access to the latest software, my sessions may be shorter too. (Right now I do five dialysis sessions a week between 3 hours and 20 minutes to 4 hours each). Settled in for a four hour stretch. 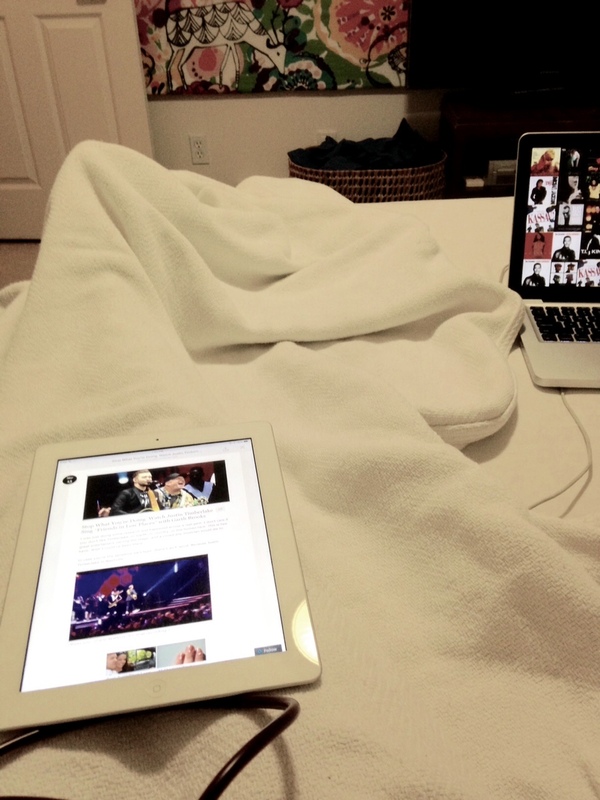 Blanket and technology are a must! Overall, I am thrilled to have this choice. I appreciate the ways my life has improved and I look forward to further improvement – like travel. Again, my decision to use NxStage is not because I believe one system is better than another. I do not believe in pitting NxStage and Fresenius and Baxter against each other helps the people living with Chronic Kidney Disease. I believe that having choice, each patient deciding what is best for them, will lead to the best outcomes for patients. This entry was posted in Message, Musings, Progress, The Bigger Picture and tagged advocate, aggressive dialysis, Baxter, best outcomes, Canada, chronic illness, Chronic Kidney Disease, CKD, control, dialysis, dialysis machine, dialysis schedule, dialysis sessions, dialysis supplies, dialysis system, Fresenius, help line, home dialysis, Home Hemodialysis, hospital grade electric, independent dialysis, kidney failure, move, nausea, NxStage, outcomes, patient, patient choice, peace of mind, plumbing, quality of life, relocate, short daily dialysis, software, stress reliever, supplies, technical support, travel. Bookmark the permalink. It is an adventure. 🙂 I’ve been lucky to have great sessions where things go well. I do understand otherwise though.